There are always new and exciting things going down at The Drake Hotel and a few of them are happening in the dining room. Chef Anthony Rose has a new menu that includes lobster nachos. Yes, I just said that. Rose throws together fresh chips with gobs of guacamole, large Maritime lobster chunks, pickled jalapenos and mornay sauce. Order it for the table. You won't be sorry. Also new, an old school shelving unit in the back of the dining room. Rose says if people are into it, the whole room could be getting a face lift. Other dishes we ordered; the super crispy sweet potato tater tots, beet salad with baked goat cheese, roasted pumpkin ravioli with sage, hazelnuts and brown butter, seared sea scallops with braised bacon and ricotta dumplings, and the daily bbq special - pork ribs. For dessert a gooey, caramelly banana pie called the banoffee, and the mile high whacky cake - a 9 layer (we counted), chocolate nutella stunning creation. It's incredibly rich and dense, but really, how can you say no to nutella anything!? 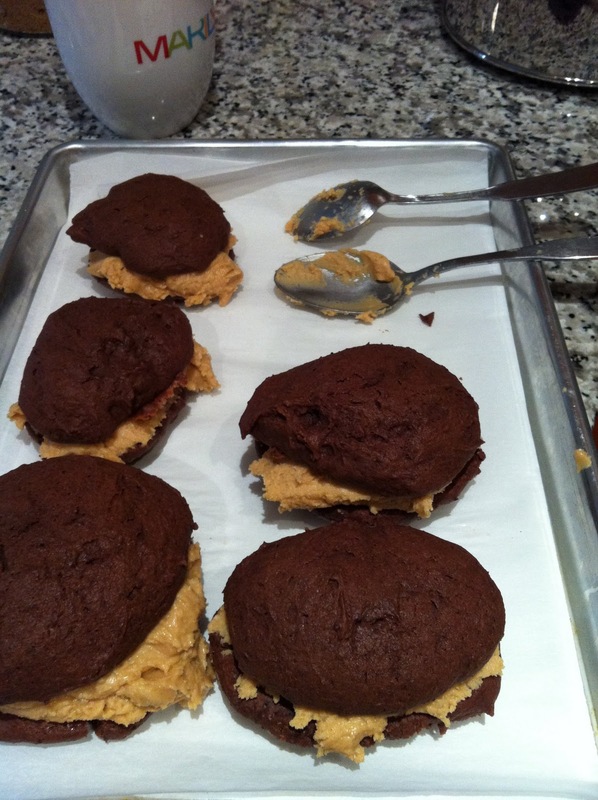 I decided to make the peanut butter whoopie pies myself, and as you can see they came out in all different shapes and sizes. They did however taste delicious. 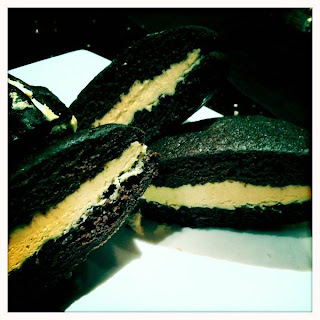 When I posted a photo of these whoopie pies on my facebook, people went crazy. So here's the recipe, go crazy! Whoopie pies are so popular now. I love them with different fillings like this one. 1. For the cake, sift and then whisk flour with cocoa, baking soda and salt to combine well. Beat butter with sugar until light. Beat in egg and vanilla. Stir in flour mixture alternately with buttermilk in three additions, beginning and ending with flour. 2. Using a small ice cream scoop or tablespoons, spoon 2 tbsp batter into 24 mounds on two baking sheets lined with parchment paper. Leave space in between for spreading. 3. Bake in a preheated 350F for 10 to 12 minutes until just firm to the touch when pressed lightly in the middle. 4. For filling cream butter with peanut butter until light. Beat in vanilla and icing sugar. 5. Place 2 tbsp filling on the flat side of 12 "pies". Cover with remaining "pies" like sandwiches. Wrap individually in parchment paper or waxed paper. Brunch at Wish. The benedict - poached eggs over peameal bacon with leek & parmesan fondue.